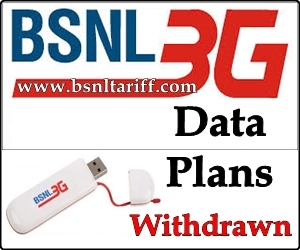 Promotional plans under 3G Mobile services which were introduced by Bharat Sanchar Nigam Limited (BSNL) earlier for limited period offer for 90 days in Kerala Telecom Circle now withdrawn from 17-07-2013. The BSNL Competent Authority of Kerala Telecom Circle announced that the following 3G Annual Data plans of Rs.1251, Rs.2299/- and 3299 started on a promotional basis for limited period withdrawn. 3G data plan of Rs.1251/- offers, 9GB Free Data usage for 12 months (1 Year). 3G data plan of Rs.2299/- offers, 18GB Free Data usage for 12 months (1 Year). 3G data plan of Rs.3299/- offers, 30GB Free Data usage for 12 months (1 Year).